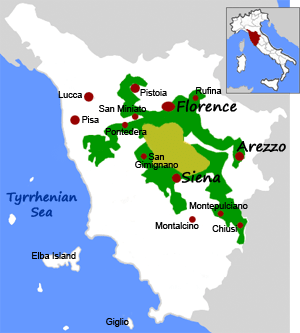 Chianti Classico is a region in Tuscany between Florence and Siena in Italy, which produces wonderful red wines from the Sangiovese grapes, sometimes combined with other indigenous or international varieties. To be “Chianti Classico” the blend must be at least 80% Sangiovese. Canada does it’s share of enjoying Chianti Classico, importing 10% of Chianti Classico wine sales worldwide in 2014. 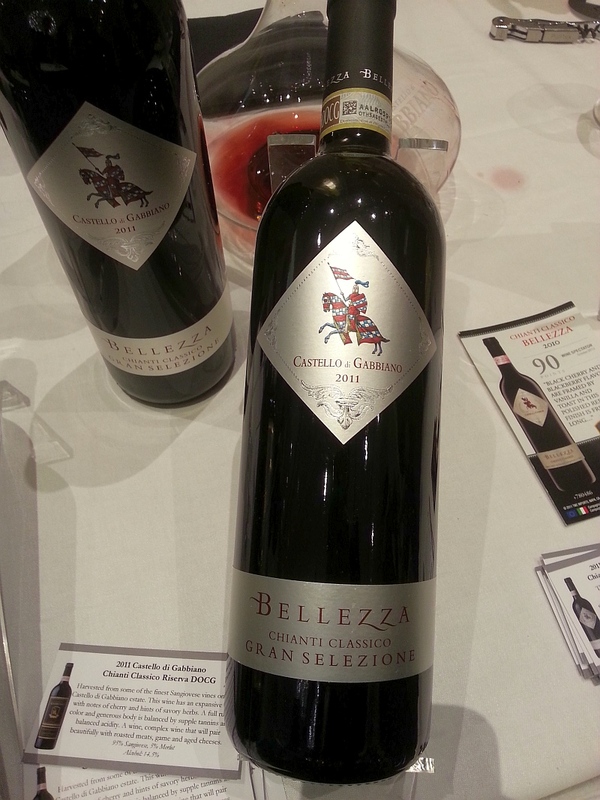 Starting in 2013, Chianti Classico updated their DOCG wine quality pyramid, adding the “Gran Selezione“. To qualify for “Gran Selezione”, a Chianti Classico must be produced exclusively with grapes from single vineyards or selected from an estate’s best-suited vineyards. The wines can only be released to the market 30 months after the grape harvest. The minimum maturation for Chianti Classico Riserva is 24 months and Chianti Classico Annata is 12 months. The winemakers of Chianti Classico are very proud of their wines, and you will see a Black Rooster trademark on the necks of their bottles or on the back label. Twenty wineries from the Chianti Classico region visited Vancouver this week, giving us a chance to taste the different levels from entry level Chianti Classico, to Riserva, to Gran Selezione wines. Below are a few that I really enjoyed. I must say that all the Chianti Classico wines I tasted at this event were of very good quality. Those wines that are a Sangiovese blend with non-indigenous grape varieties are “Super Tuscans”. Cin cin! Castello di Gabbiano Chianti Classico DOCG Gran Selezione Bellezza 2011 – 100% Sangiovese. Light cedar and vanilla nose. Medium body with round mouthfeel. Ripe red cherries followed by cedar and vanilla. Tastes very rich in your mouth.Drying tannins on the finish. Principe Corsini – Villa Le Corti Chianti Classico DOCG Gran Selezione Don Tommaso 2010 – 80% Sangiovese and 20% Merlot. Light intensity nose of vanilla and cherries. Medium plus body, soft and round, with flavours of ripe cherries, sweet spices and vanilla. Tannins kick in mid plate. Peppery finish. Nice. Carobbio Chianti Classico DOCG Riserva Carbbio 2011 – 100% Sangiovese. Light intensity, dark cherry aroma. Medium plus body, soft with tea leaves and red fruit flavours followed up with oak. Tannins build slowly. Cennatoio Chianti Classico DOCG Cennatoio Oro 2013 – 95% Sangiovese and 5% Colorino. This organic wine, has a light smoky nose together with cherry aromas. Medium body, round with light nutmeg and other sweet spices, together with dark fruit and Old World woodiness on the palate. Firmer tannins. 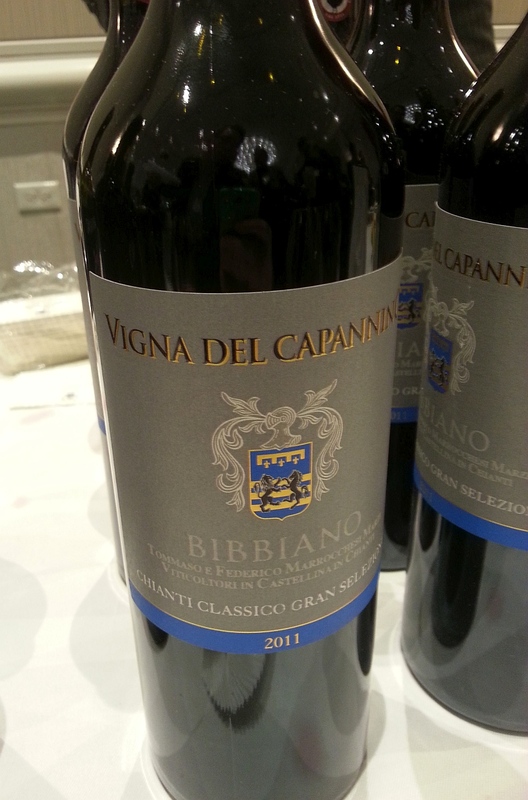 Bibbiano Chianti Classico DOCG Gran Selezione Vigna del Capanino 2011 – 100% Sangiovese Grosso. Rich, ripe dark fruit and nutmet on the nose. Full bodied, mineral quality, with tea leaves, followed by ripe cherry flavours. Fine, firm tannins. Light vanilla throughout followed by a peppery finish. Very good. Rocca delle Macie Chianti Classico DOCG Gran Selezione Riserva di Fizzano 2011 – 95% Sangiovese and 5% Merlot. Nice light smoky nose together with nutmeg spice. Medium body, with light mouth feel. Smoky with red cherry flavour. Spicy starting mid palate. A complex wine. Castello di Cacchiano Chianti Classico DOCG Castello di Cacchiano 2009 – 95% Sangiovese, 5% Canaiolo, Malvasia Nera and Colorino. Restrained fruit nose. Fuller bodied with pronounced minerality. Medium acidity and fine tannins. Fruit forward with ripe, dark fruits and a hint of vanilla. Peppery finish. Many of these wineries do not have representation in BC or Alberta, so if you are an agent looking to expand your Italian wine portfolio, give consideration to these wineries.